When popular artist Nicholas Alexandre is shot and killed in a patron’s bedroom and his body dumped in Whitechapel, it is up to the talents of Drs. Mikhail Stanslovich and Dante Savoy to bring him back to life. Since the death of his beloved sister a few months before, Nicholas has lamented his pact with the fae master, Azgarth—for the world of the fae is one of broken promises and terrifying illusions. Fae agent, Roman Cetanni has spent his tenure as one of Azgarth’s representatives trying to shield his charges from the fae master’s wrath. But what once seemed a division of worlds has now morphed until the lines between the human and fae world are blurred. Even as Roman tries to help Nicholas recover from his injuries, a new threat looms. Lately more beings from the fae have invaded the human realm, and Oiredon, another fae master, wishes an alliance with Roman and his charges to aid in overthrowing Azgarth. In these uncertain times, one thing is for certain: war has come to the fae and the lives of the humans they’ve touched hang in the balance. Light caressed Lady Clarissa’s bare breasts, creating interesting shadows as supplied by the long dark hair that cascaded over her shoulders in tousled curls. The strands revealed as much as they hid. She lay on the bed, gaze fixed out the window, staring at the moonlight. A pensive expression filled her lovely face. She didn’t do pensive well. Pouting and preening were more in line with her nature. Oh, there were the intrigues, instigations, and incidents, but they were solely to amuse. Nicholas Alexandre put the finishing touches on the canvas and stepped back from his work. He’d painted her as Tatiana from A Midsummer Night’s Dream. Most people assumed Shakespeare wrote the play as a fanciful comedy. What they didn’t know, or understand, was the fact the Bard wrote it from his experiences of the fae realm. Lady Clarissa was as much Tatiana as any woman Nicholas had ever known. Petty and jealous, she lived in a world where her needs and desires were met at the cost of those around her. He indulged her because her behavior, though outrageous, amused him. He enjoyed the way her schemes horrified society. These days, it was the only thing that lifted his grief. The door burst open and banged against the wall. The fact his mother hadn’t left her bed since his sister’s death, notwithstanding. Realization and pain morphed into fury, filling Rodderick’s eyes. He fought an inner demon that shone in the dark depths. The gun went off. Nicholas watched in horror as the shot struck him true. Crimson bloomed across the front of his white shirt, spreading like paint through a jar of mineral spirits. Odd how no pain registered. The paintbrush dropped from fingers that no longer worked. Sound became a distant, hollow thing. A scream came from behind him, but even that had the quality of a train entering a tunnel, the whistle fading into the dark earth. If he’d had the ability, Nicholas would have laughed. A mortal wound would not kill one such as him; it only released him into the hands of the fae master, Azgarth. And therein lay his real fear. Servitude on this plane was one of commerce, a way to provide for his family in the manner they’d become accustom. Being one of the chosen in the fae realm for eternity was not the thing of beauty Azgarth promised. The thing he’d seen welling in Rodderick’s eyes. The only one to derive any pleasure from such an association was Azgarth himself. However, it might give him a chance to see Juliana again. To see if she’d been taken into the fae realm on her death and protected. He was unsure if Rodderick meant Nicholas, Clarissa, or Azgarth. He moved his arm to try to cover the wound and staunch the flow, but could do nothing more than watch as the blood began to soak into the carpet beneath. Nicholas tried to inform Rodderick that he was very much mistaken—he still lived and heard every word they said. The one to kill him was much worse than Rodderick could ever imagine. Rodderick nodded mutely. He started out of the room, then turned back as Nicholas took one last shuddery breath. Cassie Sweet lives in beautiful Pensacola, Florida and often enjoys watching the Blue Angels do practice flyovers from the window in her writing nook. Growing up with a great love for the Grimm’s Fairytales and the original Star Trek, her stories might involve paranormal elements, space travel, or a combo platter of both. 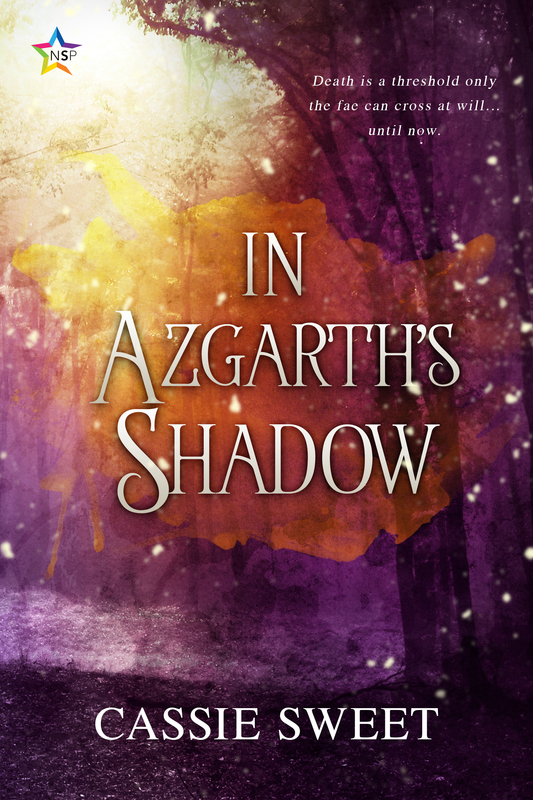 Tagged Cassie Sweet, Excerpt, Giveaway, In Azgarth's Shadow, IndiGo Marketing & Design, Promo, Rafflecopter, Release Blitz!